Triathlon Club of San Diego friends at Great Lakes Brewing Company. Laurie and Craig 15 minutes before race start. On August 11th I raced the USA Triathlon National Championships (Olympic Distance) in Cleveland, OH. Nationals is always one of my most important races of the year. The primary goal this year was to get 1 of the 18 slots available in my age for the 2019 World Championships in Lausanne, Switzerland. The slots can roll down as far as 25th place so I had to finish in the top 25 to be considered, but I wanted to be in the top 18 to control my own destiny. My pie in the sky goal was top 10. In 2017 I was 7th. My wife Laurie traveled with me. She is my #1 fan and she always brings me good luck. We spent part of 8/10 volunteering at the race expo. It is always good to give back to the sport. 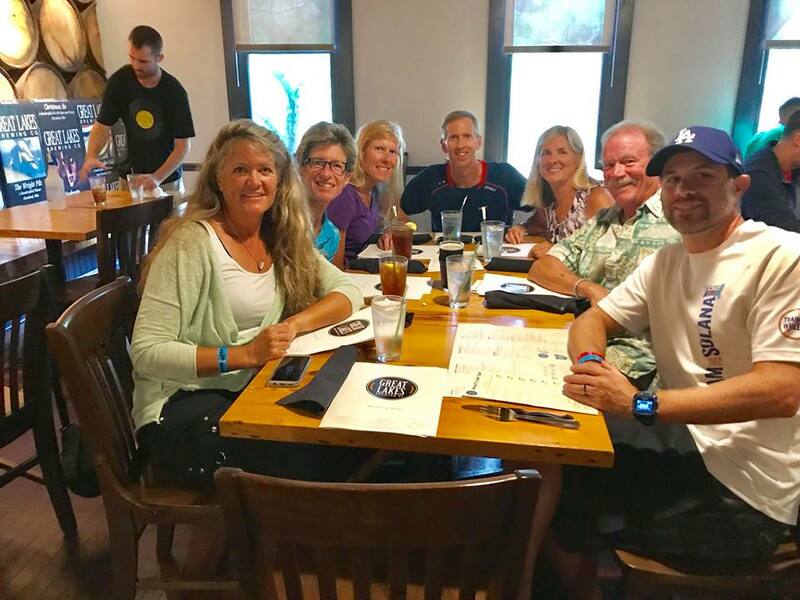 And the night before the race we had a wonderful dinner at Great Lakes Brewing Company with some friends from the Triathlon Club of San Diego. The big news in the days prior to the race was the water temperature of Lake Erie. Wetsuits are allowed if the water temperature is less than 78. The temperature was climbing and it was 79 on 8/10 – too warm for wetsuits. I’m a reasonably good swimmer so I was not stressing over the temperature. When I arrived at the venue on race morning, race announcer Tim Yount said the Lake Erie temperature was 76. A big cheer erupted among many of the nervous athletes as wetsuits would be permitted. Lake Erie is a shallow lake so it is prone to choppy conditions. It was very choppy on race morning so I was glad to wear the wetsuit. Typically I would swim 1.5K (0.93 miles) in 23 minutes. It was such a rough swim that I came out of the water in 32:18. I hoped everyone had as much difficulty as I had. I felt like I did my best and I swam a fairly straight route. I had no idea at the time, but I was in 26th place. The 40K (24.8 miles) bike course was fast with very few turns. The roads were smooth, except for a few bumpy patches over the bridges. It seemed like very few guys passed me on the bike. That could be bad news as maybe they were already ahead of me after the swim? Or since that swim was so rough, maybe I did great and they could not catch me? I can be such a head case during these races, but mostly I had positive thoughts. I felt great with my performance on the bike. My split was 1:08:42 (21.7 mph). This was the 65th fastest time on the bike and it dropped me to 32nd place. We ran 2 laps to comprise the 10K (6.2 miles) run course. It was challenging as it had some tough hills. The tougher the better for me. I started the run next to my San Diego friend, Troy Cundari. I figured that was good news for me since Troy is a strong athlete. I felt solid on the run. The course was spectator friendly so Laurie was able to see me multiple times. One of the times she hollered at me “you are running like hot butter through a knife”. That line has been an inside joke between us since we heard Jens Voigt say that on this year’s Tour de France telecast. She purposely said it just like Jens and got it backwards. A unique challenge toward the end of the run course was the flyover bridge. This was a man-made bridge made specifically for this race. It enabled the athletes finishing the swim to run under, while the athletes finishing the run to run over. It was a very steep ramp up and then very steep on the way down. The flyover bridge was positioned 200 meters from the finish line. My mentality at that point is to sprint as fast as I can. That mentality nearly caused me to crash running down the steep flyover bridge. I was completely out of control, but only by the grace of God was I able to avoid a major wipe out. I actually got caught by a volunteer just before I crashed into some metal fencing. I finished with the 2nd best run split 38:01 (6:08/mile) to give me a 2:23:37 finish time. 4 guys finished within 61 seconds ahead of me and 1 guy was 8 seconds behind me. This was good for 11th place out of 151 men in the 55-59 age group and a slot on Team USA in Switzerland. I was very happy with my result. Troy placed 19th so he should also get a slot for Switzerland. I accomplished my primary goals for 2018 which were to qualify for 2 different World Championships in 2019. On 9/1/19 I’ll be racing in Lausanne and on 9/8/19 I’ll be racing the Ironman 70.3 World Championships in Nice, France. I feel very blessed by God to get to enjoy a racation like that. Sadly, 75 year old Jim Hix died during the swim portion of the race. Jim was the 2017 USA Duathlon National Champion for the men 75-79. I did not know Jim personally. Jim’s race started 1 hour before mine. I had no idea of this news until 8 hours later. Please keep Jim’s family and friends in your prayers. 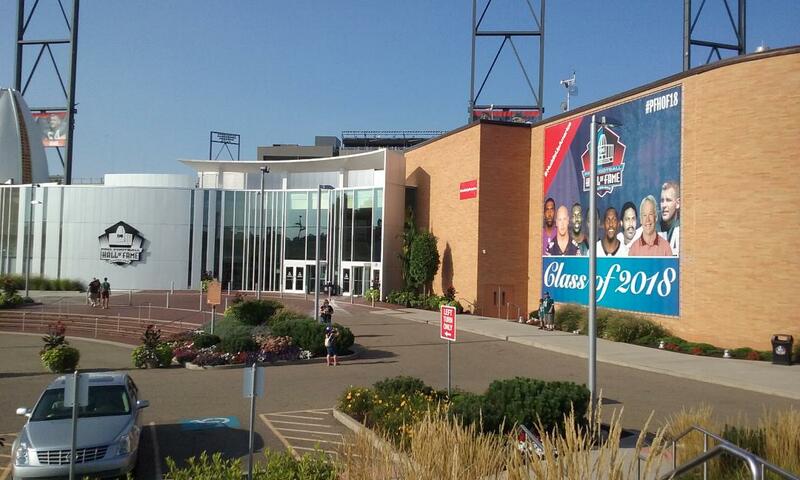 On 8/12 I drove an hour to Canton to tour the Pro Football Hall of Fame. It was well worth it. I can’t wait for next year’s trip to Cleveland for Nationals when I plan to visit the Rock ‘n Roll Hall of Fame. 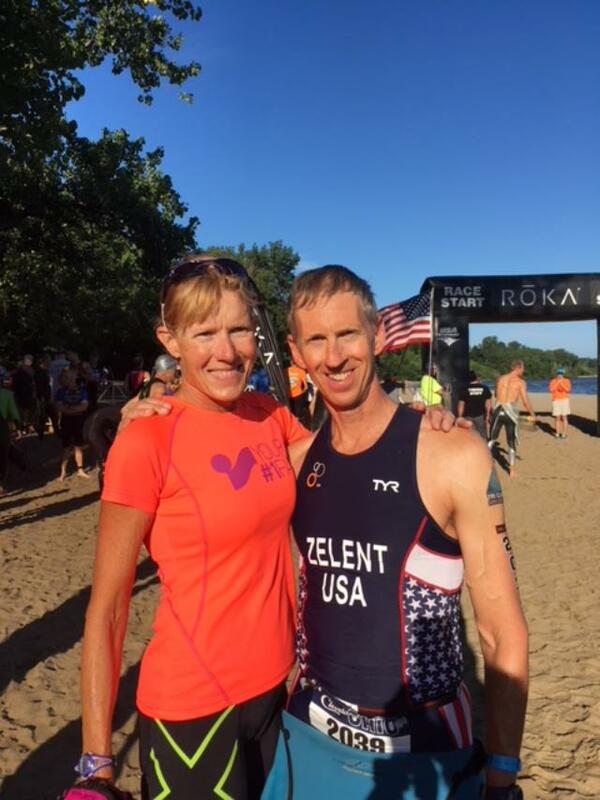 This entry was posted in 2018, Triathlon and tagged 70.3, Cleveland, Craig Zelent, duathlon, France, Great Lakes Brewing Company, Ironman, Jim Hix, Lake Erie, Laurie Kearney, Lausanne, National Championships, Nice, Pro Football Hall of Fame, Rock 'n Roll Hall of Fame, Switzerland, TCSD, Tim Yount, Triathlon Club of San Diego, Troy Cundari, USA Triathlon, USAT.. Bookmark the permalink. Thank you much! It’s great to hear from you. I miss all the old friends like yourself from Tri City Wellness. At least, I get to see you at the occasional TCSD function. Good luck with your training and racing!